If our body is putting all its energy into processing all the food we’re feeding into it, it has less resources and energy to put into detoxification and healing. We want to give ourselves food which is nourishing, healing and strengthening and reduce intake of anything which could be challenging to our digestive systems, stimulate the growth of pathogens, cause inflammation or intolerance. Knowing where to start can be a minefield especially if you are trying to achieve too many objectives (Paloe, candida, adrenal, GAP diets and more). Every webpage I go to tells me something different and its totally confusing, but as I have some training in this field I have some solid understanding on which to base my decisions. The fact that my hearing loss is in both ears, and is also fluctuating could suggest there is an autoimmune element so I also want to eliminate foods which are known to play a role in autoimmune conditions. 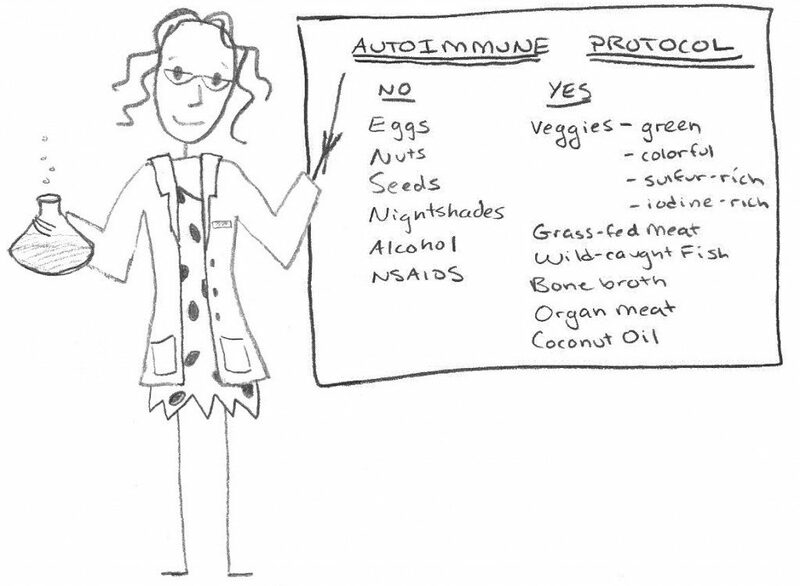 While autoimmune conditions might not yet be curable, research has shown that they can minimised through diet and lifestyle choices. This is because gut dysbiosis and a leaky gut are believed to be involved in all known autoimmune diseases. Therefore those with autoimmune conditions really need to address diet and lifestyle factors (sleep and stress also affect digestion) and heal the gut as part of our approach towards healing. The reason for eliminating these food items from my diet is they are the most common dietary allergens and play a role in causing inflammation and stimulating the immune system in the body. Since I really want to bring down inflammation (especially in my ears) I’m happy to eliminate these products for the time being. The whole time I was following the above diet I was chomping away on nuts. Since my last hearing drop a few weeks ago I’ve even got rid of them (sadly) because I decided I need to go the whole hog and do the Auto-immune Paleo (AIP) diet. This is a pretty extreme diet which aims to remove every single inflammatory agent for a month and then gradually introduce items one at a time to see which aggravate the condition. I had to let go of my nightshade veggies as well 🙁 goodbye aubergine! I miss you). I do occasionally find I’ve made a mistake especially with the spices but essentially I’m 99% there. Personally I cant take any risks with my hearing so am not sure how I’ll do the re-introductions. I’ll probably just keep everything out until I can get some allergy testing to determine exactly which foods might be affecting me. Either way it’s beneficial for my system to have a good clean out. I tend t find that the more the body gets used to clean food the less it craves the other stuff. It feels good to detox and only ever gets difficult in the face of pressure from other people who might want you to eat with them or eat out. I’m not going out much right now so that’s not a problem for me. I know its too early to judge but I do wonder if my tinnitus is a little less scary and overwhelming since I went full AIP. The AIP diet isn’t for everyone but is indicated for people suffering with conditions such as Rheumatoid arthritis, Lupus, Inflammatory Bowel diseases, MS. Type 1 Diabetes, Psoriasis, Graves or Hashimotos disease. Fruit – Whilst it’d be tempting to eat lots of fruit and honey I want to reduce my sugar intake in order to stabilise my blood sugar (and sweet addiction), support my adrenals and reduce any Candida overgrowth in my body. I’m trying to keep fruit down as much as possible, to around 2-3 pieces per day. I’m also wondering if the tinnitus gets worse on those days when I have had quite a bit of fruit. Raw vs. Cooked – I was initially eating lots of raw foods as these can be very cleansing, but this has actually been really challenging to my digestion as it has to work harder to break everything down. This is evidenced by my big round pot belly and confirmed by my acupuncturist who says I need to focus on warm, cooked foods which are more suitable for me and supportive to the spleen and stomach meridians. Meat – So since I’m on a Paleo diet it would be easy to assume that I just pig out like a cave-woman on meat all day. But this wouldn’t really be going in the direction I’m aiming for as meat takes a lot of work for the body to break. Although I’m limited in my food variety right now I’m trying to keep meat to every other day where I can. Flavourings – I’m slightly lost without my spices (many are seeds) and soy sauce, so am using mostly fresh herbs, tumeric, garlic and ginger for flavourings. Eating plentiful amounts of – Sprouts (rich source of vitamins and minerals), sea vegetables (strengthen kidneys), Beetroot (lovely for liver) and green leafy vegetables. For more information go to www.thepaleomom.com who has tonnes of resources. If you’re also doing the diet please share any tips and recipes. I hope to build a recipe page here soon.